I could start the year out with a nice, healthy recipe that would help you all out in your healthy eating resolutions. I made this pasta last night, and even though it isn't terribly photogenic, it's too tasty not to share. This recipe would work well without the lobster, or with shrimp/other shellfish, and you could even omit the bacon to make it vegetarian (but seriously....BACON). The dish comes together in about 25 minutes, so despite the level of indulgence and deliciousness, it's completely do-able on most busy nights. Hubs snapped the pic on his phone, so it's not great, but trust me, this is delicious. 1. Fill a large (6 qt) pot 3/4 full with water and heat on high until boiling. 2. Meanwhile, preheat a large skillet and put your bacon in the pan, and saute until it's semi-cooked and you have a nice glaze of bacon fat (remember, I told you this wasn't healthy!). Add the shallots, and cook for about 3-4 minutes. Add the mushrooms, cook for another 5 minutes or so, then add garlic. Cook this until the mushrooms have finished releasing water, and the whole thing has started to try out a little bit. Add the butter. Your mushrooms will cook down a LOT. Add the balsamic vinegar and quickly stir it around. This gives the mixture the slightest hint of sweetness and acidity. 3. By now, your water is probably boiling. Drop in your shellfish and cook for 3-4 minutes (cook time will depend on the size of your lobster/shrimp). You want to cook it in the shell, because the shell will add flavour to the water, which will in turn flavour your pasta. Remove the shellfish from the water without dumping the water, and strain out any bits of shell. Let shellfish cool a bit. 4. Deglaze the mushroom pan with white wine - I used a cheap sauvignon blanc, but the rule of thumb is to pick a wine you would drink - I'd recommend a bolder, dry wine for this. Scrape the pan and get all the good bits. Add the whipping cream, mix it all in and let this mixture bubble away until it reaches the consistency of a nice thick sauce. 5. Once your seafood is out of the pasta water, add about 1 T of salt, then add the pasta and cook to al dente, according to package directions (somewhere between 8-12 minutes, depending on your pasta shape). 6. Drain the pasta, but don't rinse it. Optional: keep back 1 c of pasta water in case you need more sauce. 7. Return pasta to pot. Add mushroom cream mixture and stir. Then stir in pesto (I leave the pesto until last because Kirkland is a raw pesto and heating it changes the flavour. 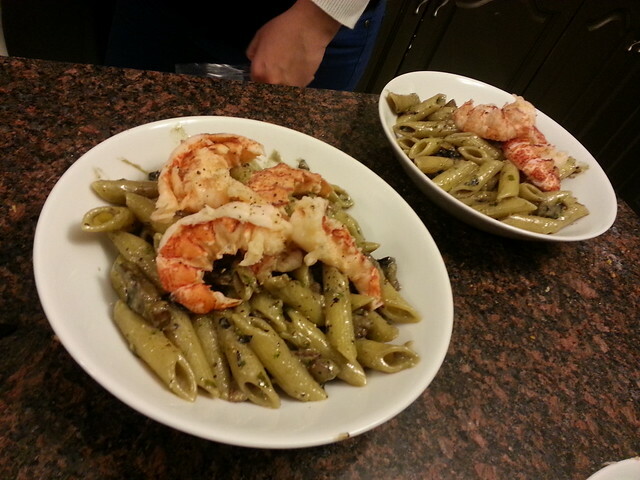 Serve in bowls, topped with shellfish, a bit of grated parmigiano reggiano and fresh cracked pepper. Salt to taste. Enjoy! Hope everyone had a great NYE and wishing you all a very happy new year. Any exciting food-related resolutions to share?